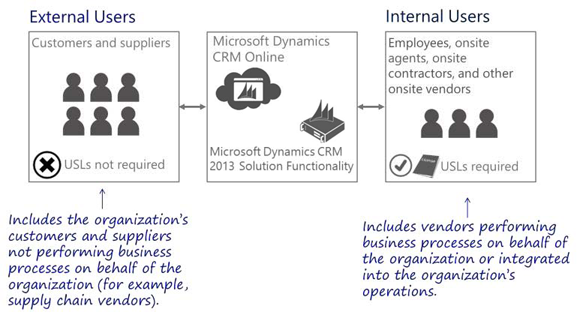 ​ Microsoft Dynamics CRM for on-premise deployment is licensed under the Server/Client Access License (CAL) model. You license the Microsoft Dynamics CRM solution functionality running on the server(s) through the Server License(s) and access to the CRM 2013/2015/2016 solution functionality by internal users and devices through CALs. ​ Microsoft Dynamics CRM Online deployments are accessed by purchaseing a User Subscription License (USL) for every internal user who will access the service. ​ Access by external (third party) users is included with the CRM Server Licenses. There is no requirement for any additional CALs or USLs unless using Microsoft Dynamics CRM client applications. External users are users that are not either your or your affiliates' employees, or your affiliates' onsite contractors or onsite agents. ​ Microsoft Dynamics CRM Online and CRM on-premise offer 3 level of licenses: Essential, Basic and Professional, each of which grants an increasingle wider spectrum of user rights. This flexibility enables customers to license the solution based on thow their users use Microsoft Dynamics CRM functionality, and mix-and-match these licenses within the deployment. The Microsoft Dynamics CRM Online and the associated use rights align to the three CAL levels for on-premises deployment. In addition, access via the Microsoft Dynamics CRM desktop and mobile applications is included with each CAL and USL at no additional charge. ​ The illustration below details the pricing for the different licensing options of professional, basic and essential licensing options for both Microsoft Dynamics CRM Online and Microsoft Dynamics CRM 2013 on-premise deployments. For Microsoft Dynamics CRM 2013 on-premise deployment, a CRM Server license is required for every instance of the software that is running on a physical or virtual operating system on a licensed server. The cost of the Microsoft Dynamics CRM Server 2013 is $3938.00 per server instance. For Microsoft Dynamics CRM Online deployments, additional instances and storage can be requested. The cost if $549.00 per production instance and $150.00 per non-production instance. If additional storage is required, it is available at $9.99 per GB. The costs for Microsoft Dynamics CRM Online is on a monthly basis. ​Microsoft Dynamics CRM provides a flexible, high value, and simple to understand licensing model for yout Microsoft Dynamics CRM deployment in the cloud or on-premise. Pricing and Licenseing information is subject to change by Microsoft at any time, and the information contained on this page, might not be accurate at this point. We will try and update this information to be compliant with Microsoft Pricing and Licensing.